Last week we did a post entitled In the Age of Kali and are continuing it here today. We begin with the description of the previous ages from Srimad Bhagavatam 1.1.21 followed by further descriptions of the age from text 1.1.22. 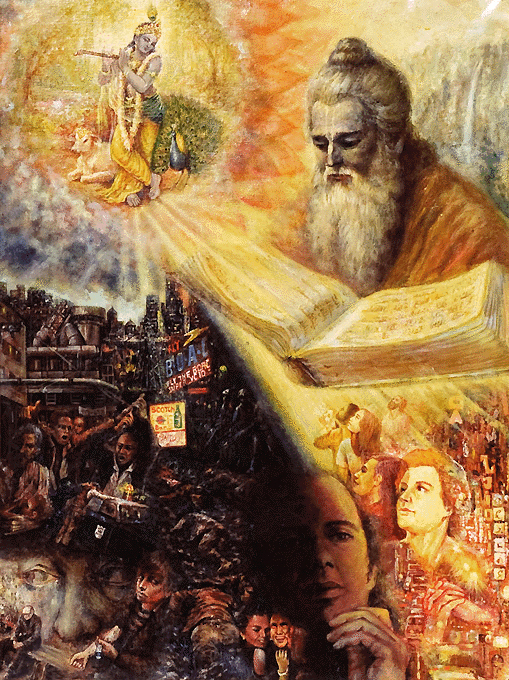 One thing that jumped out at me from my reading this morning was from the purport to text22, wherein Srila Prabhupada points out: “…people do not realize that this brief life, is but a moment on our great journey towards self-realization.” That put things in perspective for me. kalim—the age of Kali (iron age of quarrel); āgatam—having arrived; ājñāya—knowing this; kṣetre—in this tract of land; asmin—in this; vaiṣṇave—specially meant for the devotee of the Lord; vayam—we; āsīnāḥ—seated; dīrgha—prolonged; satreṇa—for performance of sacrifices; kathāyām—in the words of; sa-kṣaṇāḥ—with time at our disposal; hareḥ—of the Personality of Godhead. Knowing well that the age of Kali has already begun, we are assembled here in this holy place to hear at great length the transcendental message of Godhead and in this way perform sacrifice. This age of Kali is not at all suitable for self-realization as was Satya-yuga, the golden age, or Tretā- or Dvāpara-yugas, the silver and copper ages. For self-realization, the people in Satya-yuga, living a lifetime of a hundred thousand years, were able to perform prolonged meditation. And in Tretā-yuga, when the duration of life was ten thousand years, self-realization was attained by performance of great sacrifice. And in the Dvāpara-yuga, when the duration of life was one thousand years, self-realization was attained by worship of the Lord. 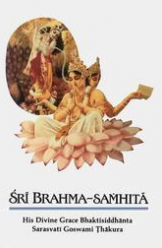 But in the Kali-yuga, the maximum duration of life being one hundred years only and that combined with various difficulties, the recommended process of self-realization is that of hearing and chanting of the holy name, fame, and pastimes of the Lord. The sages of Naimiṣāraṇya began this process in a place meant specifically for the devotees of the Lord. They prepared themselves to hear the pastimes of the Lord over a period of one thousand years. By the example of these sages one should learn that regular hearing and recitation of the Bhāgavatam is the only way for self-realization. Other attempts are simply a waste of time, for they do not give any tangible results. 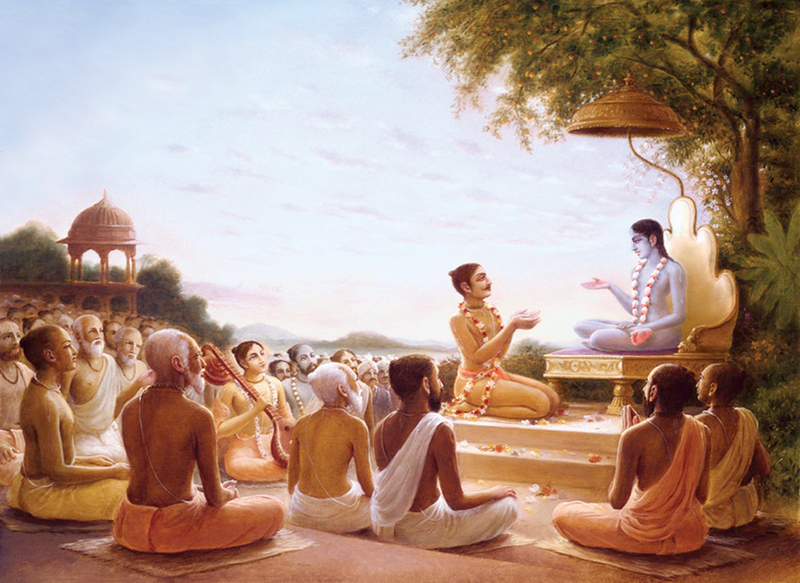 Lord Śrī Caitanya Mahāprabhu preached this system of Bhāgavata-dharma, and He recommended that all those who were born in India should take the responsibility of broadcasting the messages of Lord Śrī Kṛṣṇa, primarily the message of Bhagavad-gītā. And when one is well established in the teachings of Bhagavad-gītā, he can take up the study of Śrīmad-Bhāgavatam for further enlightenment in self-realization. tvam—Your Goodness; naḥ—unto us; sandarśitaḥ—meeting; dhātrā—by providence; dustaram—insurmountable; nistitīrṣatām—for those desiring to cross over; kalim—the age of Kali; sattva-haram—that which deteriorates the good qualities; puṁsām—of a man; karṇa-dhāraḥ—captain; iva—as; arṇavam—the ocean. We think that we have met Your Goodness by the will of providence, just so that we may accept you as captain of the ship for those who desire to cross the difficult ocean of Kali, which deteriorates all the good qualities of a human being. The age of Kali is very dangerous for the human being. Human life is simply meant for self-realization, but due to this dangerous age, men have completely forgotten the aim of life. In this age, the life span will gradually decrease. People will gradually lose their memory, finer sentiments, strength, and better qualities. A list of the anomalies for this age is given in the Twelfth Canto of this work. And so this age is very difficult for those who want to utilize this life for self-realization. The people are so busy with sense gratification that they completely forget about self-realization. Out of madness they frankly say that there is no need for self-realization because they do not realize that this brief life is but a moment on our great journey towards self-realization. The whole system of education is geared to sense gratification, and if a learned man thinks it over, he sees that the children of this age are being intentionally sent to the slaughterhouses of so-called education. Learned men, therefore, must be cautious of this age, and if they at all want to cross over the dangerous ocean of Kali, they must follow the footsteps of the sages of Naimiṣāraṇya and accept Śrī Sūta Gosvāmī or his bona fide representative as the captain of the ship. The ship is the message of Lord Śrī Kṛṣṇa in the shape of Bhagavad-gītā or the Śrīmad-Bhāgavatam.